AJ's Designs: Double release at Aurora Wings! Double release at Aurora Wings! Happy Friday and welcome to an awesome double release at Aurora Wings! 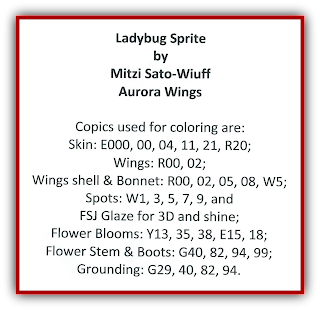 When I say “awesome” that always means (for me at least) that Mitzi has designed new sprites to add to her collection of sprites digital images. I love all the sprites at Aurora Wings. I was able to get both images colored and one art card project completed. 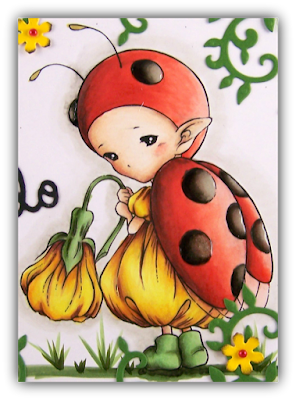 The first one, "Ladybug Sprite," is the one I decided to make into a card. The first thing was completing the Copic coloring (see above). Next was deciding on the cardstock and designer paper. The cardstocks that I decided on was Fun Stampers Journey (FSJ) 12” x 12” FSJ’s Black Licorice, 8½” x 11” Summer Days, Kiwi Slice, and Candy Apple. My designer paper was from Gina K. Designs Poppy Prints. With the above cardstock, I trimmed the Black Licorice down to 6” x 12” for a 6” card base. The Kiwi Slice and Candy Apple cardstocks were layered under the Poppy Prints designer paper. The main image was trimmed with Spellbinder’s A2 Curved Matting Basics A #5 die and layered with the Candy Apple and Black Licorice cardstocks. After I had the base and Ladybug Sprite taken care of I started die cutting all the embellishments. Spellbinder’s Draping Vines Frame was cut in the FSJ’s Kiwi Slice cardstock. That was the perfect size for my 6” x 6” finished card. That die also comes with the tiny flowers that I cut with FSJ’s Summer Days cardstock. There are the cutest tiny humming birds, along with the tiny flowers, but those will be for something else. The “hello” is from Spellbinder’s D-Lites Sentiments Five die and cut from more of the Black Licorice cardstock. This die has curly ques at the beginning and ending of the word “hello.” I trimmed off the end curly que so it would fit. Before I finished with the embellishments I sponged the edges of the flowers with FSJ’s Black Licorice True Color Fusion ink. This added a little “oomph” that the flowers needed so they would not get lost on the front of the card. My final touch was the tiny flat-backed red pearls, from my stash, in the center of each flower. 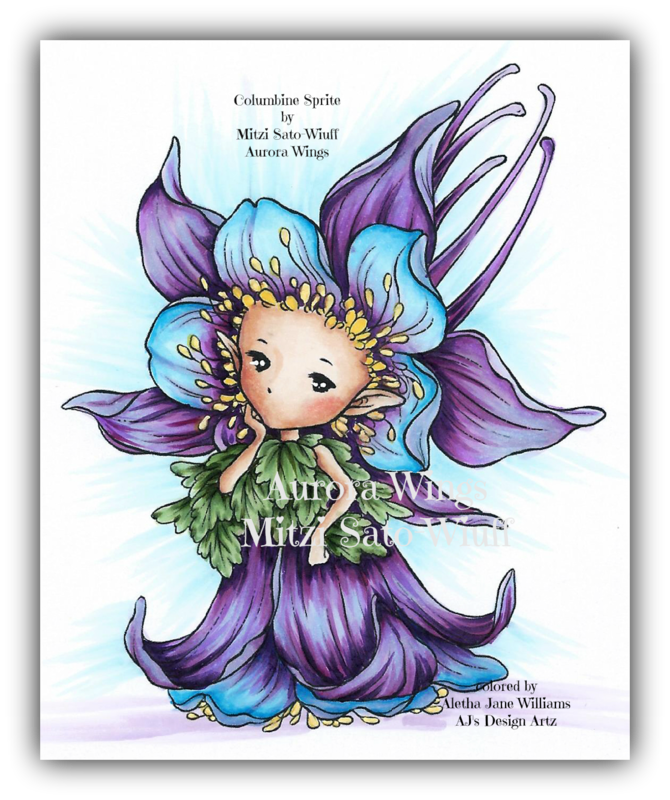 This next image, “Columbine Sprite,” was fun to color, or at least I had fun combining my Copic Bs and Vs. 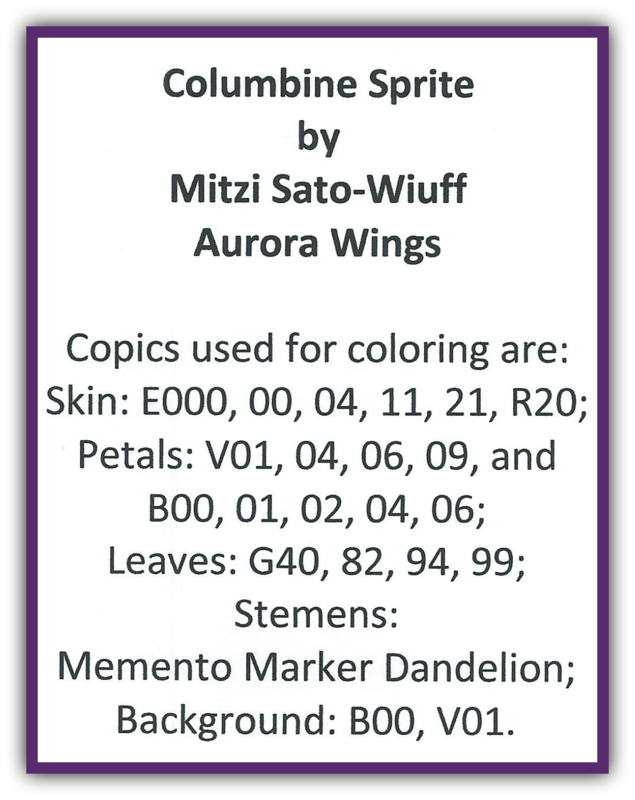 I did a little research on colors for the Columbine flower and these are the colors that caught my eye (purple is one of my favorite colors anyway). Mitzi is having a 25% off sale in her Aurora Wings Etsy store. Use code DIGISAVE25 for 25% off with a minimum of $10 in digi purchase. This coupon code is good through July 17th through July 19th. 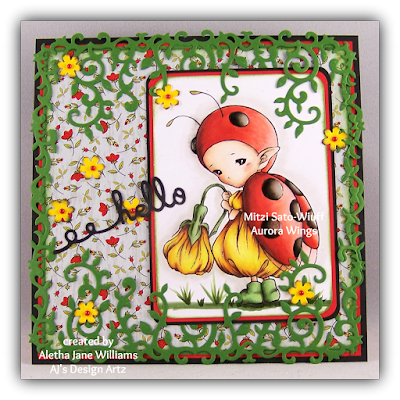 If you have not joined our Stamps by Aurora Wings Facebook group, now is the time to check it out. There’s always something going on. I hope you enjoyed your visit. Thanks for stopping by. 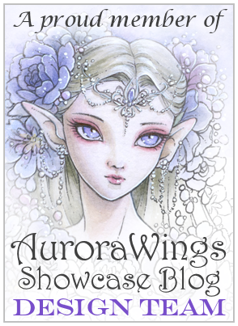 Please stop by our Aurora Wings Showcase Blog and take a look at what the rest of the designers have created. You will be inspired. If you have any questions, don’t hesitate contacting me. You always do such a signature coloring job, Aletha! Beautifully rich jewel tones with such attention to detail. I love the addition of green and yellow into the classic red and black for your Ladybug Sprite card. The vines die beautifully suggests a lush garden. So whimsical! 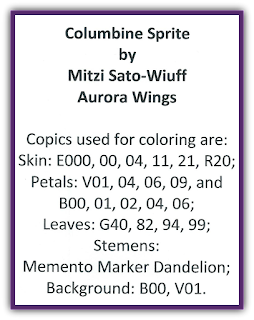 The purple and azure comobo on the Columbine Sprite is spectacular. Your full range of dark to light really brings out the petal texture beautifully. Thank you for the gorgeous inspirations for the new releases today!